One Simple Way: Turn Off the Lights! If you are reading this blog, chances are pretty good you are concerned with the environment. Unfortunately, many of us don’t do as much as we can as far as conservation goes. Most typically, this is because we either don’t know what we could do, or we think measures are overly difficult or expensive. These inhibitions are not completely unfounded. Installing solar panels can be quite expensive, and gray water systems can be quite an ordeal. There are a plethora of simple changes that we each can make that are simple, inexpensive, and can positively impact the environment. This is the first of a series of articles that provide you with such solutions. Today’s topic is reducing or eliminating unneeded lighting. In less sophisticated circles, this is known as ‘turning off the freaking lights when you leave the room.” I know I may sound like your parents when you were a kid, but I am going to put you on the spot. Are there any unneeded lights on in your house right now? If you are anything like me, the answer is probably yes. However, if you have more than just a few lights on, don’t feel too bad. Energy use is often overlooked because, unlike physical waste, it does not sit around our house until we take it out. In the United States, approximately 50 percent of electricity is produced by coal-fired power plants. These plants emit sulfur dioxide, carbon dioxide, nitrous oxides, and heavy metals (including mercury). 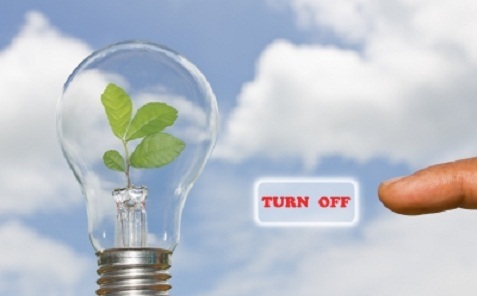 Turning off unneeded lights is simple and free. In fact, it is better than free; it can save you money. It is simply a matter of changing habits. While the exact level of energy conservation depends on the type of bulbs you are currently using, your region, and the size of your dwelling, it is a reliable rule that if you are not using a light, you should turn it off. If the environmental benefits are not enough to entice you, energy conservation through lighting can be a very frugal option. A very nice breakdown can be found here. Using natural lighting may also have health benefits. Many people find transitioning to natural light from artificial calming. This calming effect may be caused by renewed exposure to full spectrum lighting, which is very difficult to recreate via artificial light sources. The hardest thing about turning off lights is breaking bad habits. Here are a few tips to help you change your behavior and save money. *Try putting reminders next to switches or room exits/doors. *Try going without artificial light during the day. You will be surprised how much energy you waste simply because you are in the habit of turning on switches when you enter certain rooms. *At night, consider using task lighting instead of lighting the whole room. For example, if you are writing, use a desk lamp instead of lighting your entire office. *If you have outdoor lighting, consider putting it on a timer or switching to solar powered lamps. I hope you found these suggestions helpful. Check out the site next week for your next Simple Way to be a little more green.